If Ponant's swank Le Boreal is an indicator of the future of adventure cruising, then One Ocean Expeditions'(OOE) Akademik Ioffe is a reminder of the original motivation behind the first expedition cruises stretching back to the ground-breaking Lindblad voyages of the '60s and '70s. That is, take a capable and robust vessel into the remote realms of the ocean in search of natural and cultural wonders. Along with sister ship, Akademik Vavlilov, the Ioffe represents the cream of the former Soviet oceanographic (read:spy) fleet that operated in ice-choked Arctic waters undertaking research (read:surveillance) in the closing chapter of the cold war. 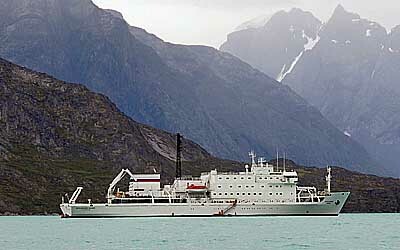 Operated by the state owned Russian Academy of Sciences (www.ocean.ru), the 117m, 6000 GT Ioffe was built in Finland in 1988 and carries typically 90 passengers for OOE on their Arctic and Antarctic voyages. While the departing Ponant passengers carefully pack their sequinned GORETEX outer wear, incoming OOE guests toss their duffles onto the deck and instantly mingle in animated groups, chatting and sharing. We have a truly eclectic mix of travel professionals, hardened adventurers, academics, birders, media and even a couple of kids eagerly anticipating the historic polar journey. Much more attention is given to the expedition and shore excursion schedule, with Ioffe merely a delivery mechanism for the enrichment and not the comparatively hedonistic refuge offered by Ponant. The voyage culminates with a (hopefully) triumphant arrival in Coppermine CA on the 26th, but with all true expedition cruises, nothing is guaranteed and everything a bonus.